Brad Pitt, as it turns out, auditioned for the lead in Phantasm II. Michael Baldwin has played Mike Pearson, the hero of the franchise, in four of the five movies, with the exception of 1988's sequel to the original. The role ultimately went to James Le Gros, but as was recently revealed by director Don Coscarelli, Pitt did indeed audition for the part. 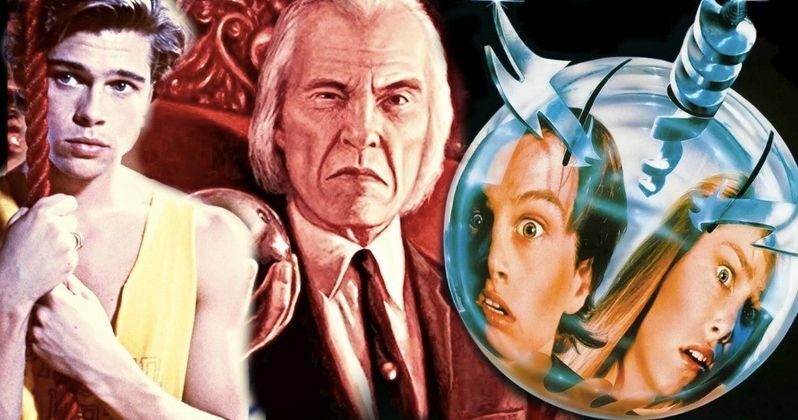 Don Coscarelli, who not only directed Phantasm II but is also the main creative force behind the Phantasm franchise, recently appeared as a guest on a Sirius XM radio show to promote his new book, True Indie: Life and Death in Filmmaking. During the course of the conversation, they were discussing the fact that the studio wouldn't allow Michael Baldwin to play Mike in the sequel. So, they had to look elsewhere. Here's what Coscarelli had to say about it. "The studio would not allow Michael Baldwin to have the role [in Phantasm II], so we had to search for other actors. I was interviewing every hunky male actor in Hollywood. When we did Phantasm III, 10 years later, I brought Michael Baldwin back to play the role, and he reminded me that he had been friends with Jennifer Aniston before she was successful. He said that he was with her and her new boyfriend, and it was Brad Pitt, and he came over to Michael and he said, 'Hey, you're the Phantasm guy! I tried out for that movie, and I didn't get the role.'" Directly from the man himself. Obviously, not getting the role didn't exactly damage Brad Pitt's career any, as it's actually tough to think of actors who have been more successful, by many measures. Despite that, Don Coscarelli didn't actually remember auditioning Pitt for the Phantasm sequel, who wasn't yet the actor we know him as these days. "Michael came and told me that and I go, 'Mmm, I don't remember Brad Pitt.' In any case, a few months later, I had nothing to do and I found this little videocassette of all of those things, and I was fast-forwarding through, and there sure enough, the casting director opens the door and she goes, 'Don Coscarelli, meet Brad Pitt.' And he walked in and, you know, he was a good-looking guy and his reading was really good. He wasn't the Brad Pitt back then, this was before he did Thelma and Louise. In any case, big mistake on my part obviously, [although] James Le Gros is a terrific actor and he's gone on to a stellar career." So there you have it. Following Phantasm II, Michael Baldwin returned for the next three installments, including Phantasm V: Ravager in 2016. As for James Le Gros, the man who beat out Brad Pitt for the role, he's had a reasonably successful career as well, starring in projects such as Drugstore Cowboy, Oblivion and Point Break. This news was originally reported by Entertainment Weekly.